So, maybe you’re looking to impress the comic book reader in your life this Christmas, but don’t know where to start. Or, you’d like to spark a love of comics in that friend who geeks out over every superhero movie. Well, have no fear, holiday shopper. Our friend Roger May, of Horizon Comics in Lancaster, Calif., is here to save the day with professional advice on what to get the comic book fiends on your Christmas list. According to May, there are two hot properties this season that comic book fans will hope to see sticking out of their stockings. The first is “Doomsday Clock No. 1,” one of a 12-issue maxiseries from writer Geoff Johns, artist Gary Frank, and colorist Brad Anderson. “It’s basically DC merging the ‘Watchmen’ universe into the DC universe,” May said. The second issue in the “Doomsday Clock” series will be released the Wednesday after Christmas, but first prints of “No. 1” are “already getting really scarce,” according to May. If you’re buying for someone who’s interested in “Doomsday Clock,” but has never read the original “Watchmen” graphic novel, consider treating them to Alan Moore’s hugely influential comic masterpiece. The other surefire comic book gift option this season is DC’s “Dark Nights: Metal,” written by Scott Snyder. The concept of the series is “the DC universe being invaded by characters from their own ‘upside down,’ to borrow a ‘Stranger Things’ reference,” May said. Indeed, “Dark Nights: Metal” even goes so far as to reference “Stranger Things” itself. “It’s like a Justice League made up all of Bruce Waynes, Bruce Waynes that made really bad decisions that led to an unstable world,” May said. Early issues may be difficult to find, at least first prints, but Horizon Comics should have in stock second or third prints of issues 1, 2, and 3, as well as a mix of first print and second print tie-in companion pieces to the main series. Those tie-in books feature Bruce Wayne versions of various DC characters, including Flash, Wonder Woman, and Green Lantern. In the “Red Death” issue, for instance, “Batman decides he’s been thinking too small and needs to save the world instead of Gotham,” May said, so he kidnaps The Flash and straps him to the hood of the Batmobile. If you’ve got a Marvel fan on your list, however, the recent release of the “Avengers: Infinity War” trailer has sparked sales of a certain graphic novel, which would make for good gift giving. The “Infinity War” movie borrows from Marvel’s “Infinity Gauntlet Trilogy,” in which “Thanos fashions a gauntlet that will hold all of the infinity gems,” May said. If you’re wondering what to get the Star Wars fan on your list, May suggests two ongoing comic book story arcs: the current “Darth Vader” series and a main “Star Wars” series. According to May, you could also opt to buy your Star Wars fan one or more of several short Star Wars miniseries, which center around characters from the universe, including Darth Maul, Lando Calrissian, Poe Dameron, Princess Leia, and Captain Phasma. For that very special comic book nerd, the one you don’t mind shelling out a lot of cash for, there are also luxe omnibuses and “absolute editions”, featuring favorite characters or stories, to consider. 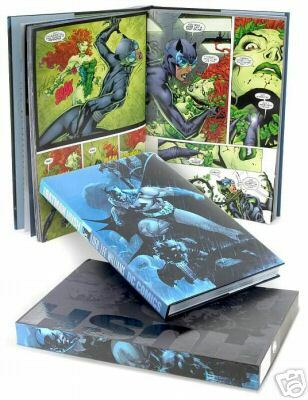 As an example, May cites his favorite series, “Batman: Hush,” which can be purchased in a large format, hardcover absolute edition. These editions typically retail for around $75 to $100, but “they’re beautiful,” May said. Still totally confused about what to get the comic book reader on your list? Drop by Horizon Comics, if you happen to live in the Antelope Valley, or your closest local comic book shop. “Come see me,” May said. Photos: Comics Alliance, DC Comics, Rotten Tomatoes, Heroes Assemble. This entry was tagged Avengers Infinity War, Batman, Christmas, comic books, Dark Nights Metal, DC, Doomsday Clock, Horizon Comics, Infinity Gauntlet, Marvel, Star Wars, Star Wars Vader Down, The Last Jedi, Watchmen. Bookmark the permalink.